Invigorating, enticing, adrenaline-pumping, and legendary -- with every single step. With 12 outside sports experiences and 3 indoor exhibits encompassing physical fitness and awe-inspiring sports history, you won’t want to miss this new model of health and fitness. 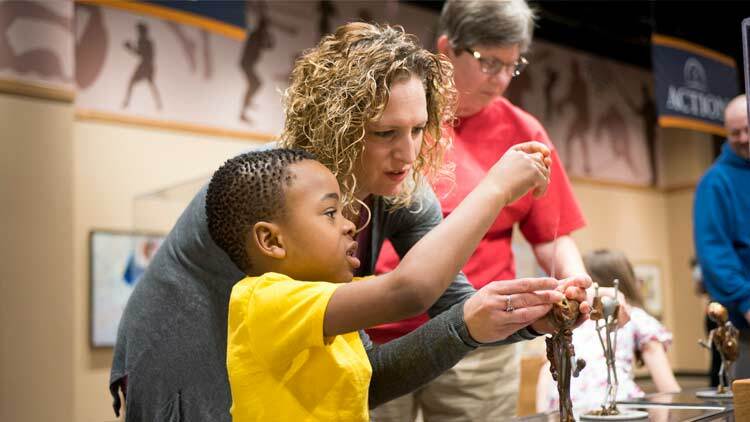 A permanent addition to The Children's Museum complex, the Sports Legends Experience makes the museum bigger and better than ever before. Run, drive, jump, putt, and play while learning how to stay happy, healthy, and safe. Meet a legendary sports character every visit, hear their story of greatness, and get coached in the drills and skills that helped them succeed. Imagine yourself in the shoes of that same sports legend, and start your story today. Tree of Sports. Climb in and out of your favorite sports and feel like you’re on top of the world! This impressive tree reaches 25 feet high inside, and its leaves reach even higher! Communicate with friends or family from the ground up with a talk tube. Climb high then take a ride on one of three tree slides. Look out onto the entire sports experience at different viewing platforms. Racing. Heed speed in your pedal car! Channel your inner A.J. Foyt and race with the family on the oval track or take to the drag strip for fast-acting performance. Stop by the pagoda to learn some auto history and watch a safety video before you take to the pedals. Choose your pedal car model: stockcar, muscle car, funny car, and more! Get your claim to fame with a photo in the Winner’s Circle. Football. 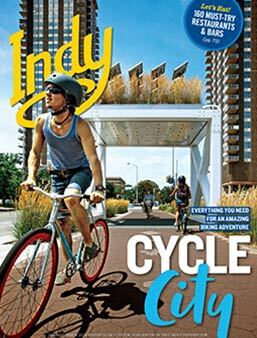 Get onto the gridiron with inspiration from your favorite Indianapolis football team—the Colts! This experience gets players of all sizes ready for an epic touchdown celebration with some basic fundamentals. Brace yourself for the line of defense by learning how to properly grip a football and dodge the opponent. Take a breather and learn about football legend Reggie Wayne. Be the ultimate kicker by practicing on one of our two field goals; one for little kickers and one for big kickers. Practice the height and angle of your throw to a family-member receiver over opponent cut-outs. Basketball. Indiana’s rich basketball history lets you play a part as an Indiana Pacers or Indiana Fever player! Get off the bench and grab a ball to learn moves like Tamika Catchings and Reggie Miller with a few fundamentals. Take to the court to practice your Larry Bird free throws at a high or low hoop. Perfect your pass at different speeds and angles to Pacers/Fever player targets. 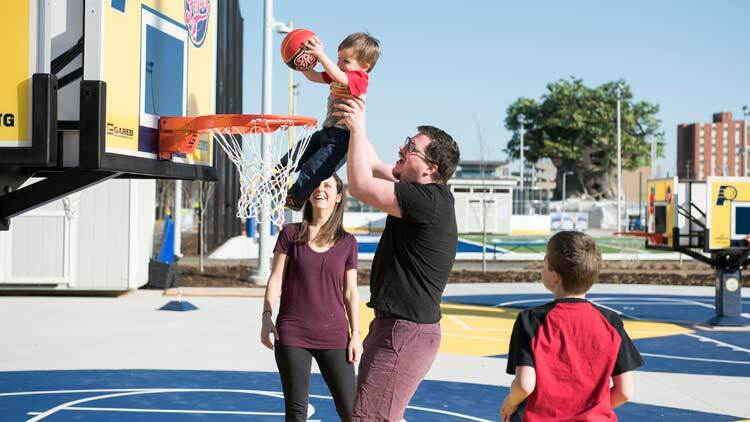 Challenge the whole family, or beat your personal best, at a shot-clock hoop. Fitness Path and Track. Get in your daily cardio on the track, and add in training stations from the fitness path along the way to to keep muscles healthy and strong! Take a stroll or sprint on a track measuring two-fifths of a mile in the Jane and Steve Marmon Run-Walk Experience. Learn about running legend Wilma Rudolph Warm up at the first station on the Cory SerVaas Fitness Path. Go through five stations with a cool-down at the last. Learn exercise tips and benefits from our friends at Riley Children’s Health. Fore! 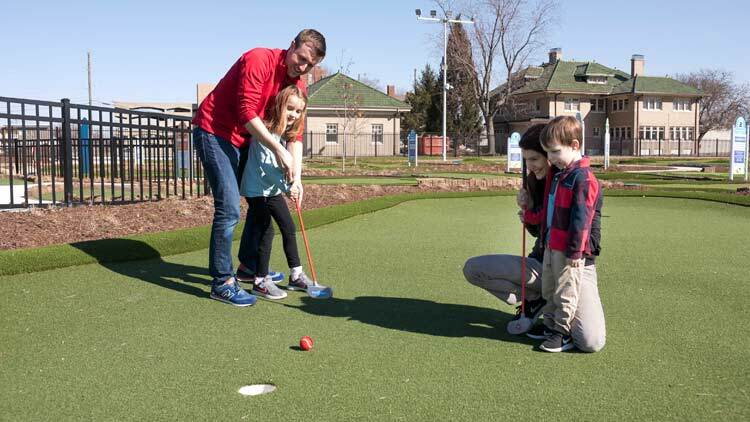 Take a swing at four nine-hole courses, with challenges for beginners to mini-golf pros. 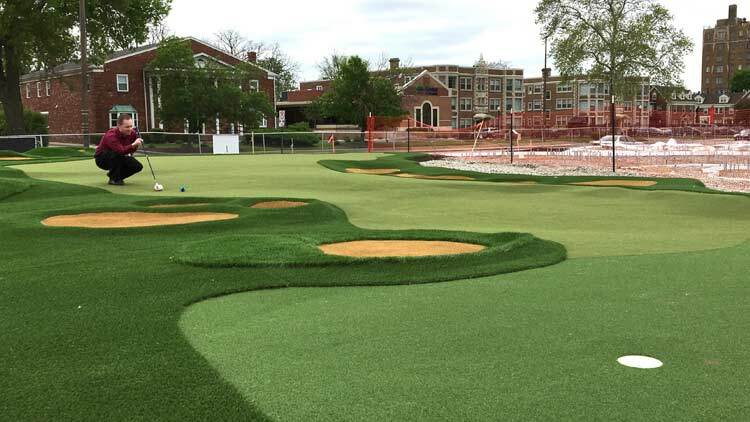 Become a putting pro while learning a bit about the extraordinary design history of Indiana natives Pete and Alice Dye. Putt at the two signature courses designed by Pete and Alice, where all of the holes are replicas of their most-famous designs from around the world. Baseball. Hit a homerun at the baseball diamond! 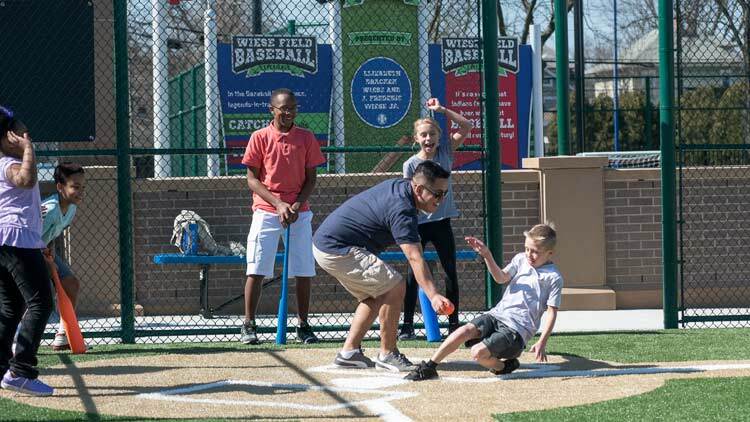 In this experience, families can learn about America’s pastime and work on their fastball. Hang out in the dugout before it’s your turn to bat. Learn about the Indianapolis Clowns baseball team. Use a tee (or not) to hit a pitch. 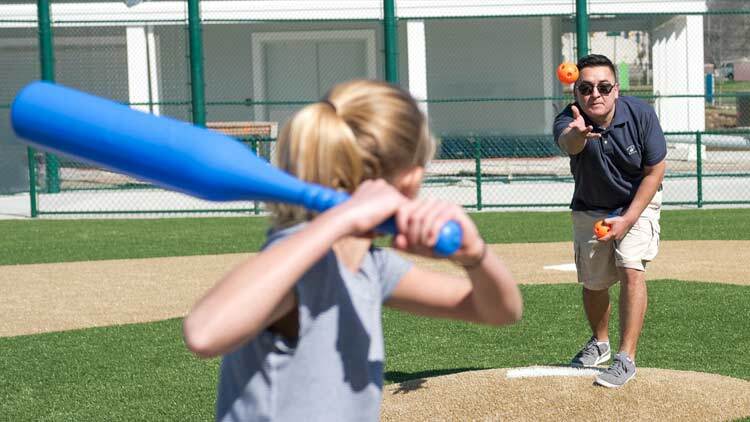 Perfect your own pitch by throwing into a pitching tutor. Soccer. Be the playmaker or the goalie! Learn some soccer fundamentals and imagine yourself as Indy’s next soccer star. Show off your fancy footwork like DaMarcus Beasley in front of one of the bigger goals at each end of the field. Kick through the goalie’s gaps at one of the smaller goals. Learn the basics of dribbling and passing along the field. History of Hoops. From driveway backboards and high school gyms, to college field houses—all the way to Banker’s Life Fieldhouse, the athleticism and explosive excitement of basketball has thrilled generations of families for over a century of Indiana hoops history. The World of Sport. 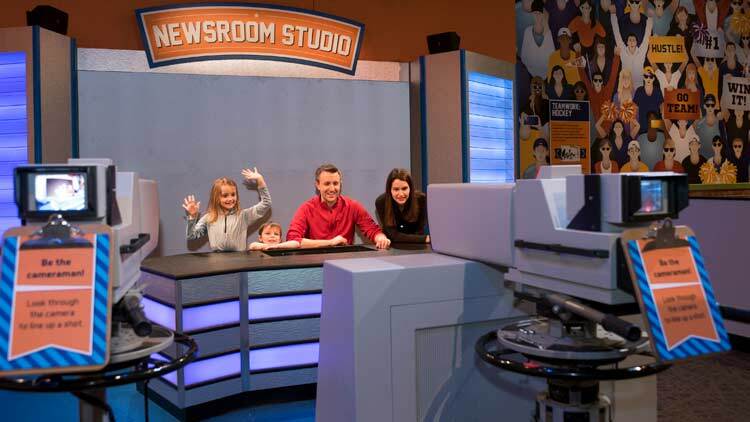 Experience the culture of sports as you play the role of an athlete, announcer, and sportscaster. Learn about iconic moments through time with family and the hard work and skills it takes to achieve your goals—sports and otherwise! Avenue of Champions. 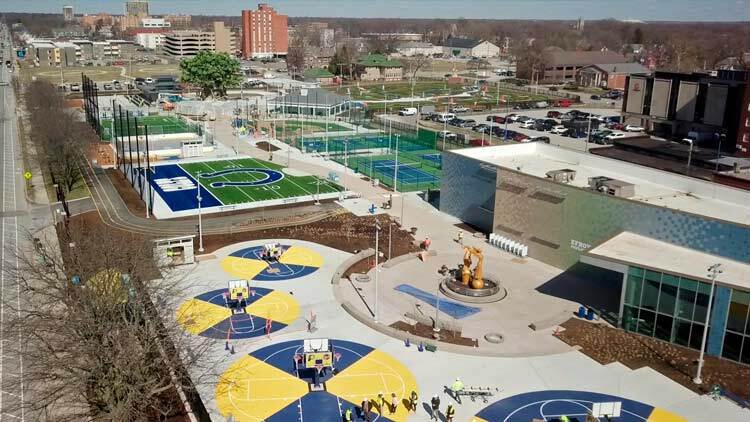 The Children’s Museum is ecstatic to represent sports legends across the nation with ties to Indiana in the Old National Bank Sports Legends Avenue of Champions within the Riley Children’s Health Sports Legends Experience. Thanks to Old National Bank, we are able to educate and inspire children and families with statues and histories of people who make sports extraordinary. The avenue features 16 individuals who have left a significant impression on sports history, who have defied odds, who have given back, and more. Hockey. Imagine yourself in the rink with the Fuel team or celebrating the Stanley Cup with Wayne Gretzky! Learn about the team and try out some things they have to work on every day. 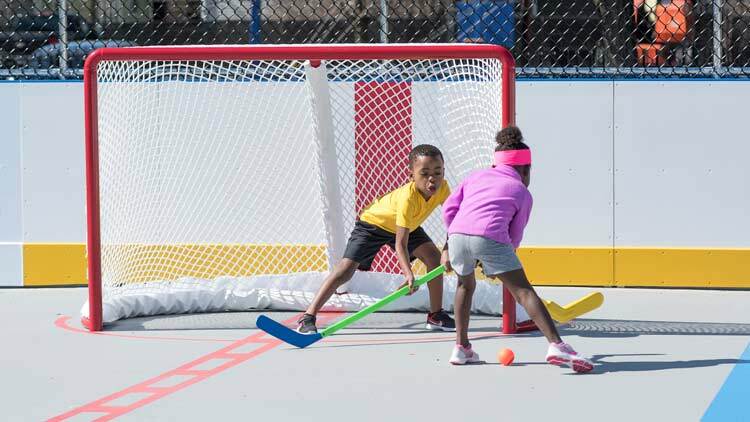 Grab a stick and street-hockey ball and play on a street hockey rink. Shoot or guard a goal. Learn how to puck handle, pass, and shoot with the family. Tennis. Fall in love with the game. 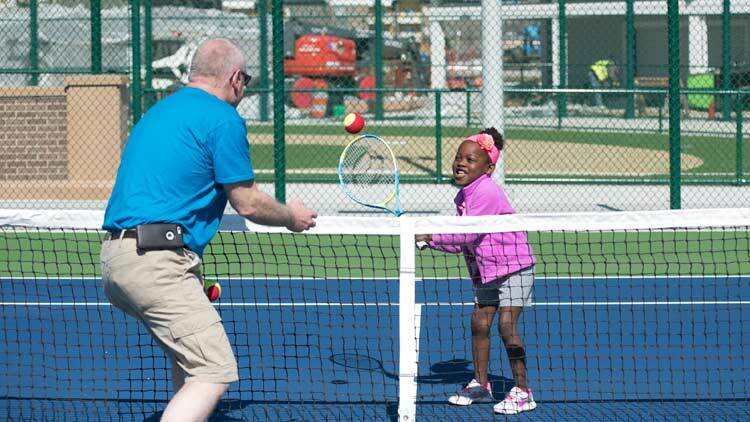 Modeled after USTA’s “10 and Under Tennis” program, our tennis courts are the perfect stop to ace your serve and return. Use one of our Net-Generation racquet and low-compression balls to hit back and forth with your family. Get inspired by Barbara Wynne’s love for the game and her passion to teach it. Challenge your forehands and backhands at our practice wall. Volley with forehand and backhand swings. National Art Museum of Sport. The National Art Museum of Sport, or NAMOS, is dedicated to celebrating sport through art. Select pieces will be on display from the collection’s nearly 1,000 works. This permanent exhibit will highlight art of iconic moments and athletes as well as art by athletes. As you walk through the Efroymson Pavilion, you'll see that art is grouped by themes, and artists like Hoosier legend C. W. Mundy will be featured!